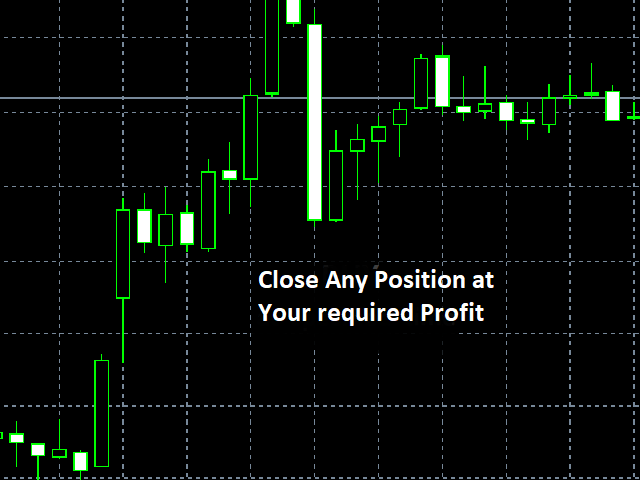 CloseAtSetProfit : unlike 'closeallprofitpositions' which closes all trade positions with a positive return, and then stops running, unless again reinitialized, this program is different in two ways: it allows you to set the profit (in currency units) yourself, at which ANY trade will be closed. This is specified in its parameter "setprofit". Also, unlike the 'closeallprofitpositions' , it does not stop running, continuously monitoring your trades , which when reach 'setprofit' is closed, below that is not closed. this is important because broker manipulation does not stop at 'stop loss hunting' but also goes both ways, if they can get away with it. you are practically setting your profit target for every trade, and hiding it from the broker. if you wish to set a profit target for all open trades together, try 'totalprofittrailer' which has its own advantages, mql mistakenly named it 'totalprofittrader' it is actually 'totalprofittrailer'.